“Your Passion and commitment for sports can lead to zenith of glory. So, think big, play wholeheartedly and win medals for the country,” said Arjuna Awardee Olympian Ajit Pal Singh (Former Captain, Indian Hockey Team). He was the Chief Guest on the final day of North Zone Intervarsity Football Tournament (Men) being held at Desh Bhagat University. He also encouraged all the players to promote sports in every possible way. A total of 69 teams from different universities from all over India participated in the annual tournament of Association of Indian Universities (AIU). teams for excellent sports man spirit. The final matches of the tournament were particularly thrilling and breath-taking and players were struggling hard for even a single point. In the final, Panjab University beat Punjabi University and lifted the trophy. The Tournament was a source of great education and entertainment for the students and staff of the different universities. 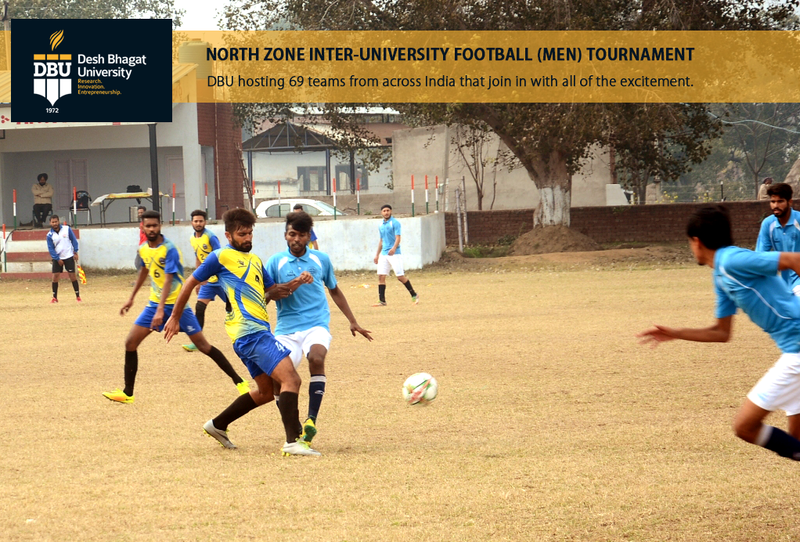 All the players and coaches of the teams appreciated the arrangements made by the host university. The officials of sponsored companies and the members of Football official committee sent by AIU were also honoured for their services during the tournament. This event was organised under the supervision of sports coordinator and Coach Nandan Singh and Mr. Rakesh Sharma was the match commissioner of the tournament.